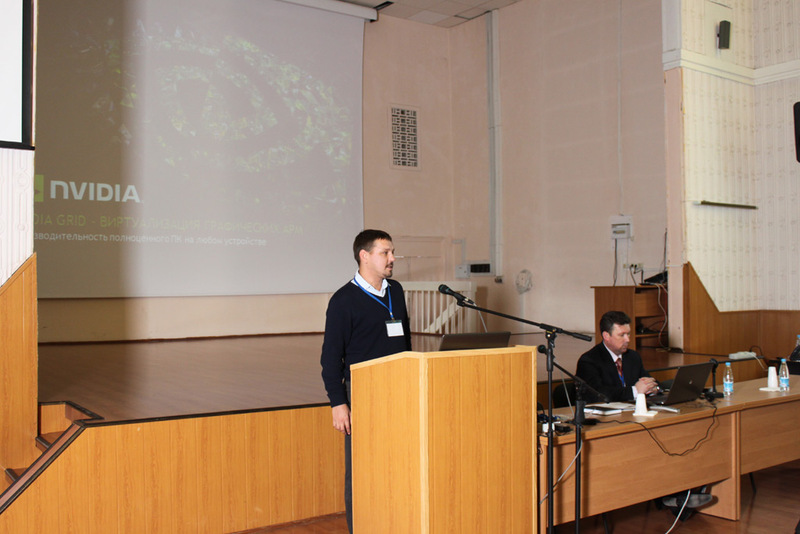 Simmakers Ltd participated in the XIV scientific conference “Information Technologies in Engineering”, held on 4-6 March 2014 in the Russian city of Tyumen. 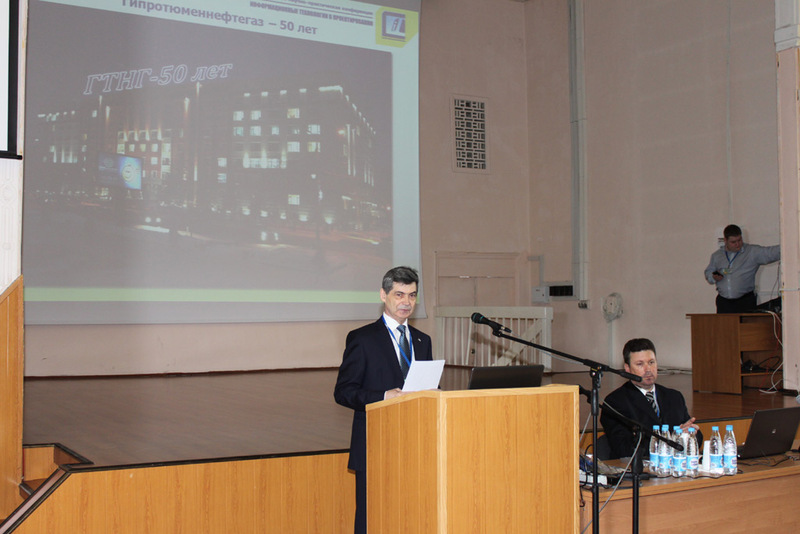 As usual, the conference was organized by the Giprotyumenneftegaz institution, which celebrated its 50th anniversary in March, 2014. Giprotyumenneftegaz is a leading Russian R&D engineering organization, providing integrated field development solutions for companies in the oil and gas industry. The conference focused on topics such as engineering technologies for oil and gas extraction, processing and transportation, implementation of CAD systems in the oil and gas industry, pipeline engineering, simulation of emergency situations, design of oilfield roads, development of software for the design of electrical power systems, etc. The conference was attended by high-profile Russian and international companies, including Bentley Systems, NVIDIA, Giprotyumenneftegaz, NIPIgazpererabotka, Giprotruboprovod – Tyumengiprotruboprovod, JSC SamaraNIPIneft, TomskNIPIneft and others. 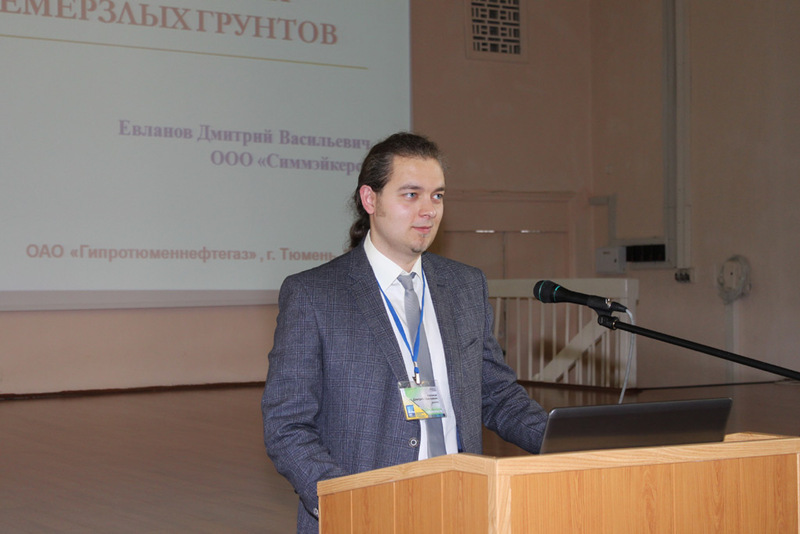 The Managing Director of Simmakers Ltd, D. Evlanov gave a presentation on the topic “Thermal Analysis in the Design of Oil and Gas Facilities in Permafrost Regions”. The report was well received by the audience, with special interest forwarded by the representatives of companies involved in the development of oil and gas fields and hydrocarbon production in the Far North. 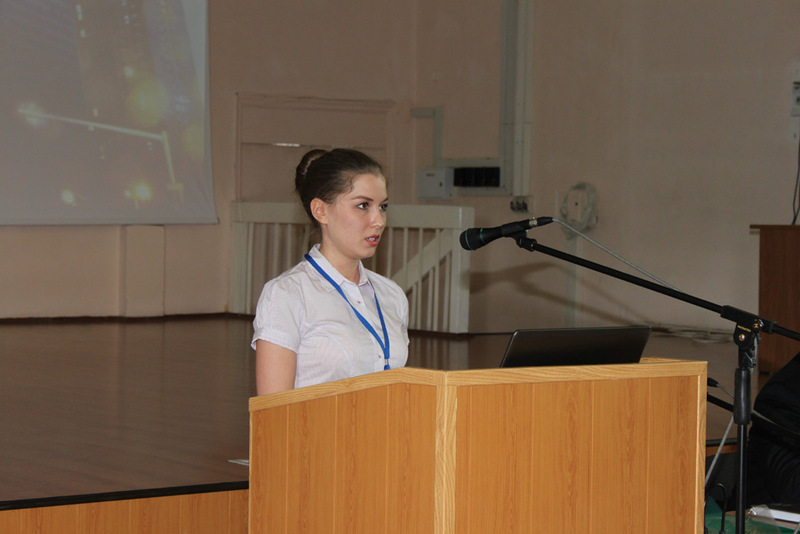 The presentation focused on performing thermal analysis in the design of oil and gas infrastructure on Permafrost. Performing thermal analyses of foundations and footings, piles, pipelines, boreholes and other oil and gas facilities is of great importance nowadays and its importance is highlighted by the fact that even a seemingly insignificant rise in permafrost temperature leads to a significant decrease in its bearing capacity. • the influence of climatic factors, etc. • The dynamics of a thaw bulb around the pipeline within 20 years was calculated and the modeling results of artificial ground freezing during the building of an underground tunnel in complex geotechnical conditions were presented. A large amount of groundwater filtration takes place in the model. • The features of the software for the computation of large-scale sites, with perimeters in excess of 1,000 m, were demonstrated via the example of the artificial ice wall around the “Fukushima” nuclear power plant. 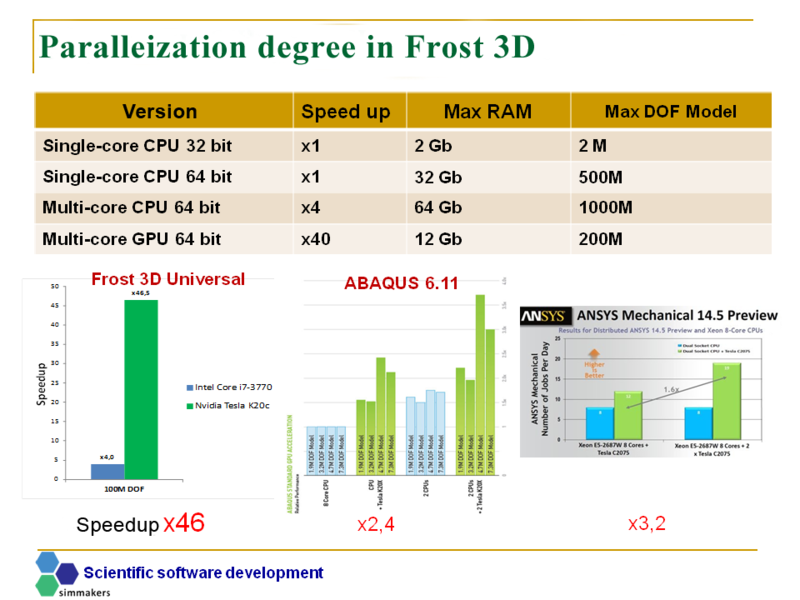 Numerical methods implemented in the Frost 3D Universal software are efficiently parallelized on multicore CPU and GPU processors. Comparative analysis of the parallelization degree of the Frost 3D Universal software showed that the computational speed on the Tesla graphics accelerator is forty times higher in comparison with the single-core version for CPUs. 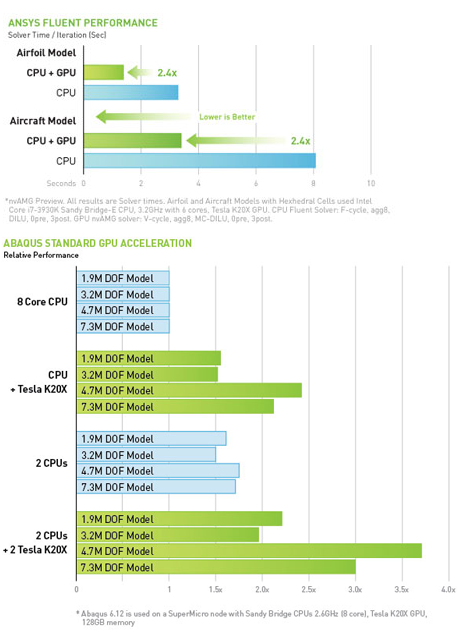 To give an idea of the significance of the performance gain above, consider well-known software solutions like ANSYS and ABAQUS, where computations transferred from CPU to GPU resulted in a maximum acceleration of 3,2 times (according to ANSYS and Abaqus official press-releases). What this means is that Tesla graphics accelerators combined with the Frost 3D Universal software developed by Simmakers can perform computational acceleration boosts previously only achievable on supercomputers.